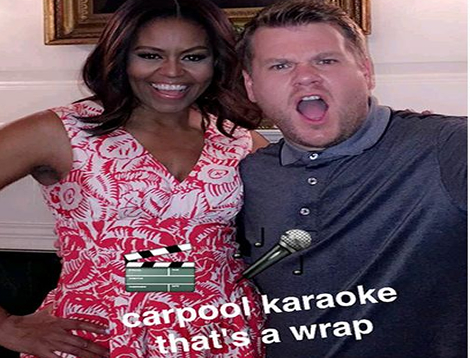 Michelle Obama has got her freak on with James Cordon and Missy Elliott for Carpool Karaoke. Recorded for The Late Late Show with James Corden, the First Lady sings along to the likes of Beyoncé and Stevie Wonder before being joined by Missy Elliot. The host starts off by driving to the White House for a tour, before being joined by the First Lady. The pair start off discussing Stevie Wonder, with Michelle admitting that he is her “favourite” before they break into a rendition of ‘Signed, Sealed, Delivered’. Corden then asks her what she’s going to miss about the White House when her husband is no longer President, before also asking what she plans on nicking before she goes. Of course, she admits that she rarely gets time to listen to songs in the car so they crank up the stereo and start singing to Beyoncé’s ‘Single Ladies’ and recreating the famous dance.